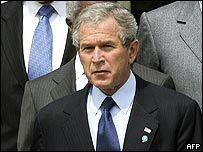 US President George W Bush has described last week's London bombs as "an attack on the civilised world" adding they would not be tolerated. Speaking at the FBI academy in Virginia, Mr Bush said: "We continue to take the fight to the enemy and will fight until this enemy is defeated." He said the bombs were proof of the need for an aggressive war on terror. Former UK Foreign Secretary Robin Cook criticised Mr Bush's approach, saying he was pursuing the wrong tactic. Praising the efforts of US troops in Iraq and Afghanistan, Mr Bush insisted that the best way to curb al-Qaeda militants was to keep them on the run. "When they are constantly on the run they can't plan attacks, so we and our allies will stay on the offensive," he said. Addressing an audience of 1,000 FBI officials, marines and members of the emergency services in Quantico, Mr Bush pledged American support for the people of Britain. "In this difficult hour, the people of Great Britain can know the American people stand with you," he said. "And just as America and Great Britain stood together to defeat the totalitarian ideologies of the 20th Century, we now stand together against the murderous ideologies of the 21st Century. "The best way to defend America is to stay on the offence," he said. Amid waning public support for the US military presence in Iraq, Mr Bush, who described Iraq as the "central front" in the war on terror, said that continuing to fight there was vital not only for the safety of the region, but for the US too. "When the Middle East grows in democracy and prosperity and hope, the terrorists will lose their sponsors. They'll lose their recruits. They will lose their hopes for turning that region into a base of attacks against America and our allies," he said. In an interview with the BBC's World Tonight, Mr Cook criticised the president's comments, saying that instead of isolating the terrorists, he had upset Muslim societies around the world. "Everybody would fully sign up to the most vigorous police reaction to make sure that we do pursue those responsible for atrocities such as happened in London," Mr Cook said. "I think the problem with George Bush's approach is that he does keep talking about it as a war on terror as if there is a military solution and there isn't." At least 52 people died in the London blasts. The UK is a major ally in the US "war on terror", having sent troops to back US operations in Iraq and Afghanistan. An internet message posted on Thursday in the name of al-Qaeda said London had been attacked because of its support for the US. UK Prime Minister Tony Blair said on Monday the attacks had probably been carried out by "Islamist extremist terrorists". Mr Bush, who was attending the G8 summit in the UK when the attacks happened in London, paid tribute to the city's "great spirit" on Saturday. His FBI speech was planned before the London attacks.